"Let's go to the Dough Zone", mumbled Goose. Huh? What exactly is the Dough Zone?" I questioned in a confused manner (which is not exactly a stretch). Really, what the heck is that??? A money laundering joint? A place where you chuck dough at each other? Some new 2 Unlimited song? Some alternate Universe? No, none of those. Rather, it is actually a Taiwanese restaurant specializing in dumplings and noodles similarly to Din Tai Fung. 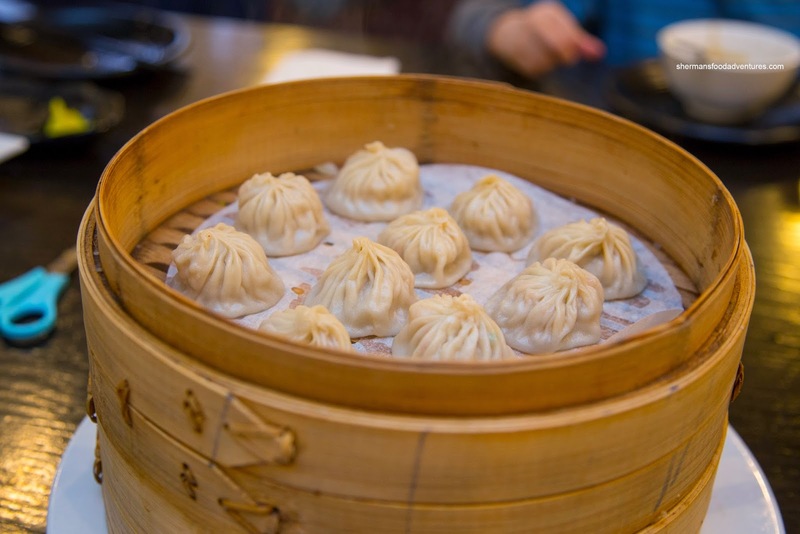 For the past few years, DTF has ruled the roost in Bellevue in regards to dumplings, but I was more than happy to enter the Dough Zone to see if we have a legitimate contender. To start things off, we got an order of their daily congee (which included a free refill) which was Corn Meal Congee in this case. Looking more like malt-o-meal than congee, this still ate like a rice porridge but with the addition of corn meal. It was thick and starchy with little-to-no flavor. No real issue though since this is often used as an accompaniment to more flavorful dishes. On the side, the kids were super enthused about the fresh made-to-order Salty Donuts. 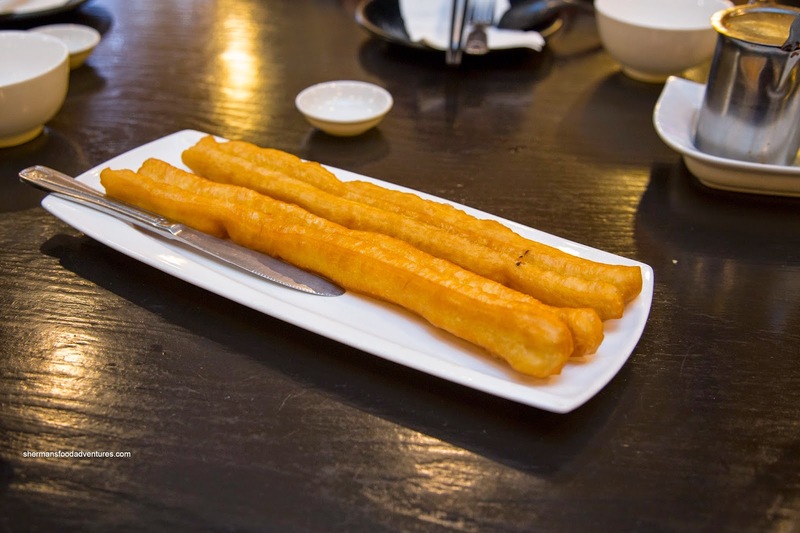 These thin and long donuts were airy, crispy and light. They did a good job draining the grease (and proper oil temp too) where they were more bready than oil-soaked. Onto some dumplings, we had one order each of the regular Xiao Long Bao and Crab Xiao Long Bao. I only took a picture of one of them because they looked practically the same. However, they did taste remarkably different where the crab added some sweetness and seafood flavor. With the regular version, there was a sweet natural pork essence and green onion with only the slightest hint of ginger. Texturally, I found the meat moist and juicy with a touch of grittiness. Both had an adequate amount of non-greasy soup. 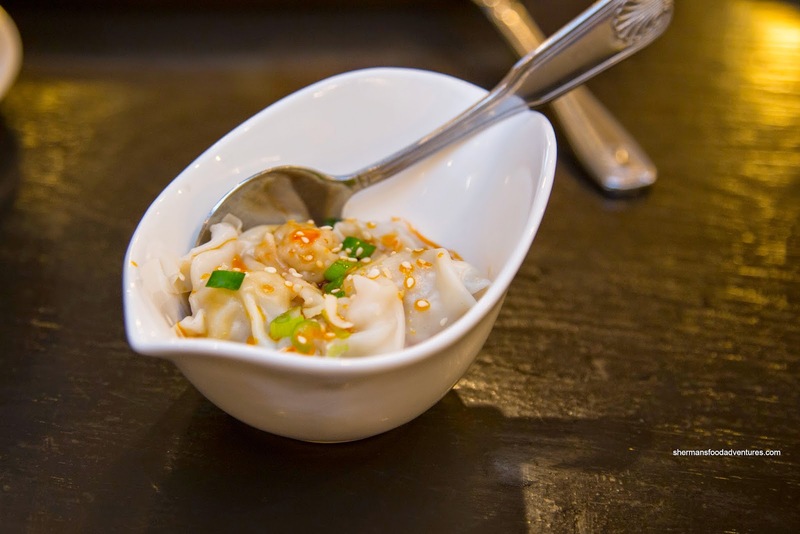 The best part was the dumpling skin as it was super thin and slightly chewy (very similar to DTF). 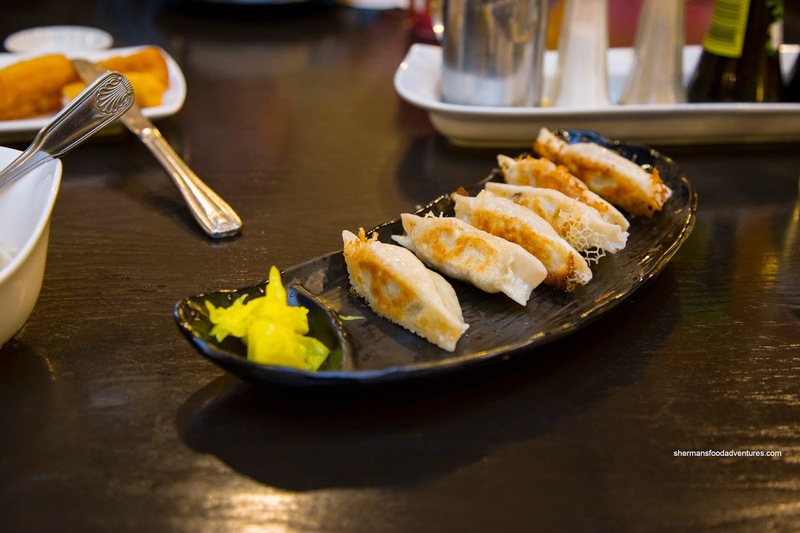 Naturally, with common elements, the Potstickers featured a thin wrapper with moist and juicy pork inside. Underneath, there was sufficient crispiness from the pan-fry. 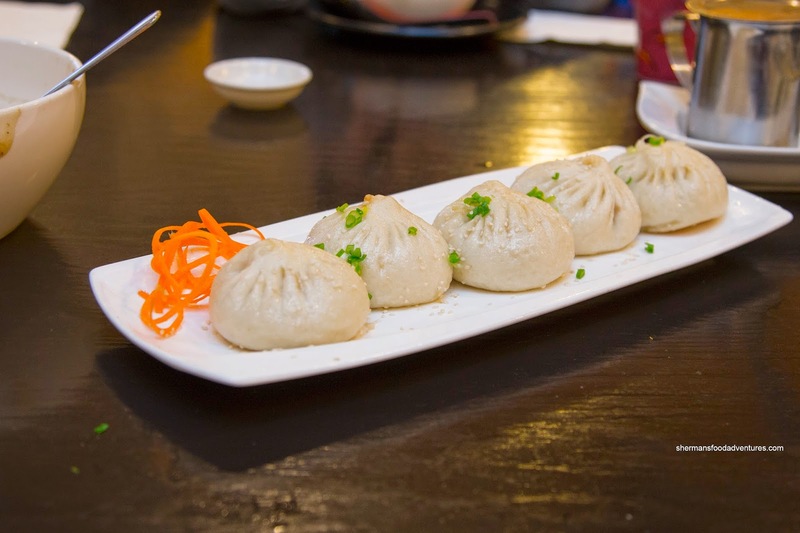 At first, I wanted to order only one dish of the Pan-Fried Pork Buns since they looked pretty large and filling. Well, I was completely wrong as these were super-fluffy and light. There was only the slightest of sear on the bottom. I would have to boldly say that the bun portion was some of the best I've had. As for the filling, it was juicy with natural sweetness accented by green onion and seasoning. When the Spicy Wontons hit the table, I thought they had served us a half order, but yup, in a small bowl was the entire order. What it lack in size was made up in quality as the wontons featured a tender wrapper with juicy meat inside. There was a noticeable spice level without being over-the-top. 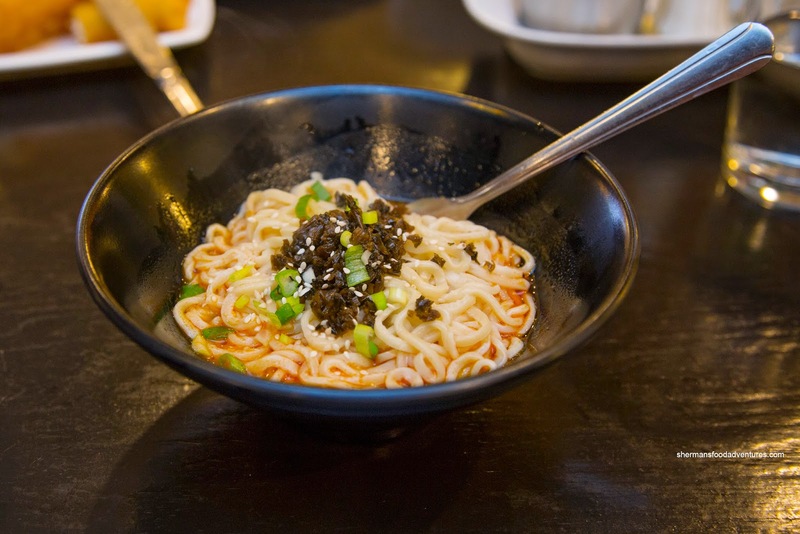 Moving along, we had some noodle dishes including the really small bowl of Dan Dan Mein. Honestly, this would only be enough for one person, yet we made it work by sharing it anyways. First off, the noodles were on point being toothsome with plenty of elasticity. Secondly, the spice level was appropriate as it didn't take away from the other flavors. However, we didn't notice much of the sesame as it was definitely in the background. Goose really loved the Stewed Pork Noodles. So much so, he got another bowl after the fact. Now if you look closely a the picture, you'll noticed the plethora of pork belly gracing the same al dente noodles (as the previous dish). Yah, it ain't diet food, but really, the pork belly melted in our mouths like butter. There was a savory richness to it that was rather appealing despite the amount of fat we were eating. 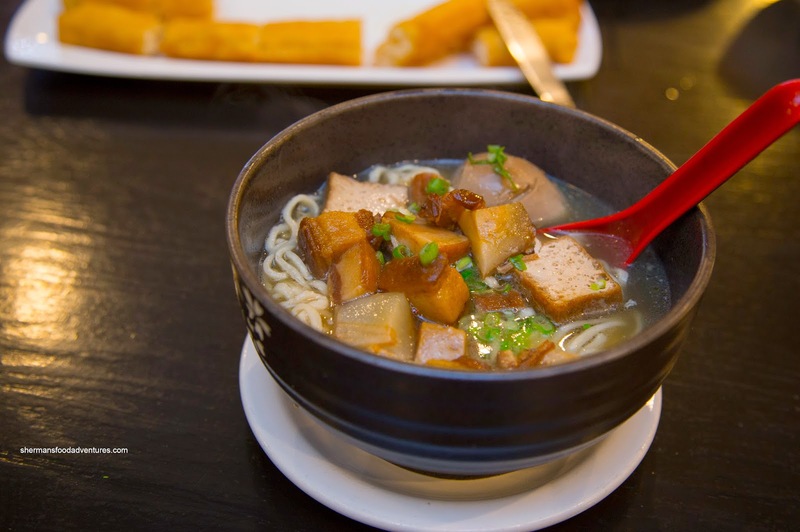 With even more noodles, we tried their House Special Noodles topped with a starch-thickened soy-based sauce with mushrooms, tofu, wood ear and pork. 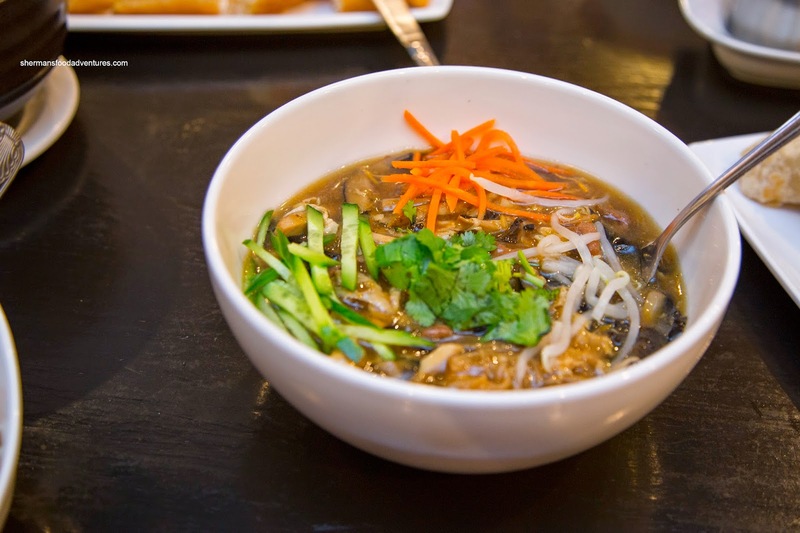 Consider it a really thick hot n' sour soup with noodles but without being hot nor sour. Therefore, the whole dish was saucy and mild tasting. Again, the noodles were chewy with a nice rebound texture. 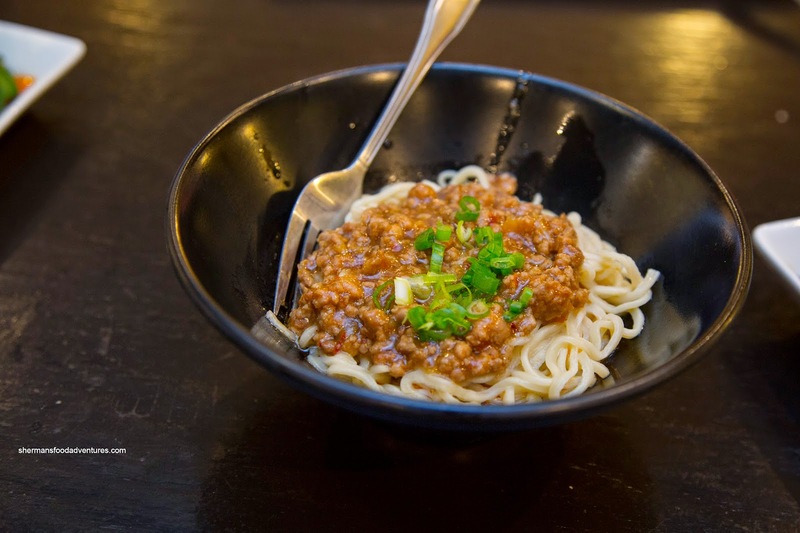 Our last dish of this type was the Noodles with Meat Sauce. And not to sound like a broken record... wait, that's too ol' skool, let's try that again: not to sound like a skipping Blu-Ray, but the noodles were once again toothsome. I found the meat sauce to be sufficient in quantity and effective in taste. There was a mild spiciness to go with the meaty savoriness. Since the sauce was pretty thick, it meant that the noodles didn't become soft from the moisture either. 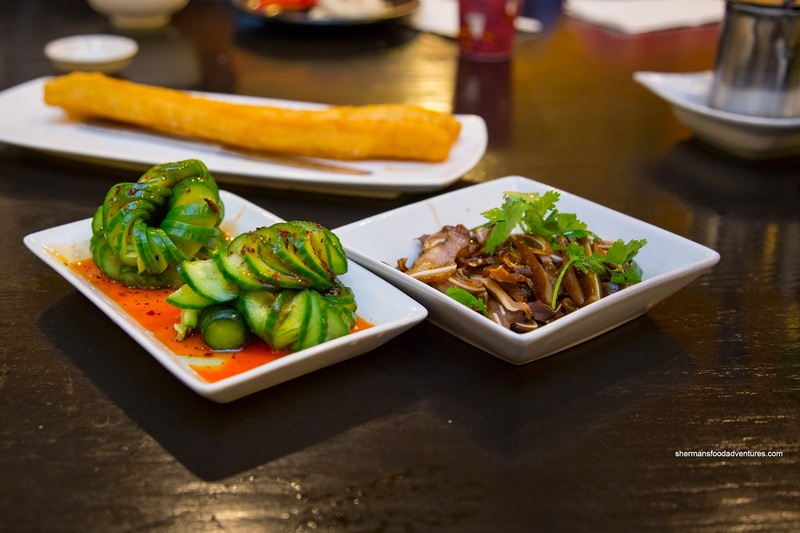 A simple dish of Pickled Cucumbers usually shouldn't elicit any intense reactions, but this one did. Attractively plated, the cucumber was crunchy, vibrant and most importantly, exhibited a good balance of sweet and tart. The chili oil was the proverbial icing on the cake as it gave the dish some jump. For myself, I had to get an order of the Marinated Pig's Ear and it was okay. Nothing much wrong with the braising sauce as it was sweet and salty. However, the texture of the ear a was a bit too soft for my liking. I prefer a bit more crunch. 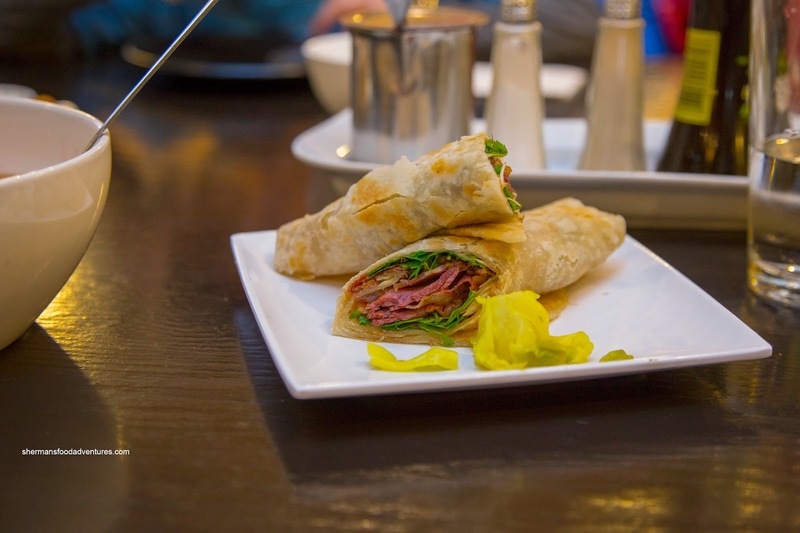 Our last item before dessert was the Beef Pancake Roll that featured a flaky and lightly crisp pancake. It was pretty thin where it wasn't a chore to chew through. Inside, there was plenty of tender beef to go with the crunchy green onions. 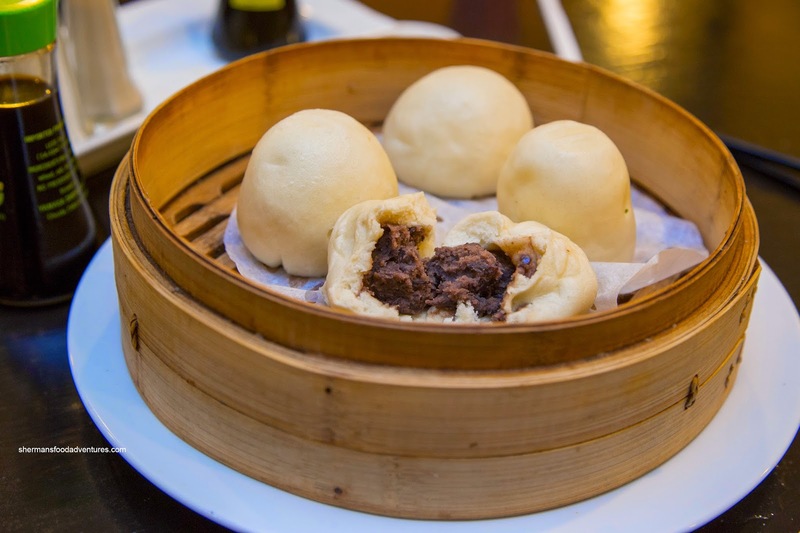 For dessert, we shared some Steamed Red Bean Buns. Beyond the soft fluffy exterior, we found a loosely blended mix of red beans that were not very sweet. We liked how it wasn't the typical over-processed super sweet red bean paste found in many other versions. Overall, we were quite pleased with our meal despite the smallish portions (not uncommon to this type of restaurant anyways). Noodles were on point while the dumplings didn't disappoint. 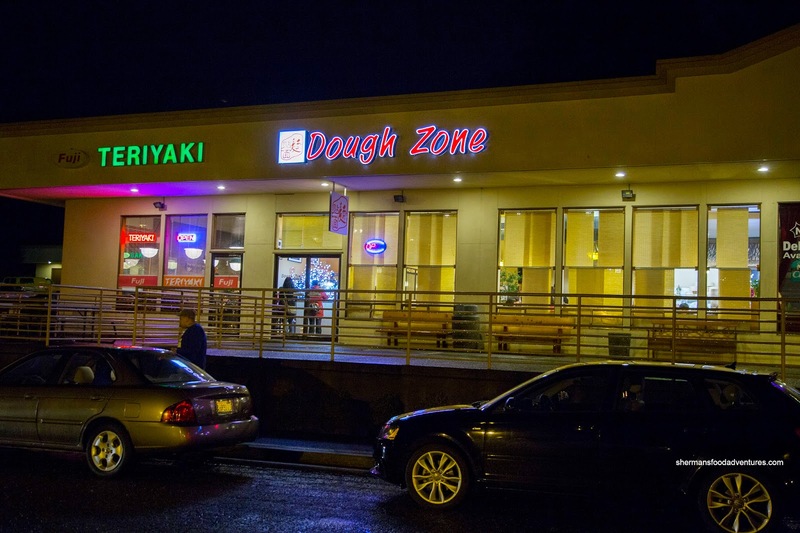 I would probably pass up DTF (Bellevue location only) and head to the Dough Zone instead. 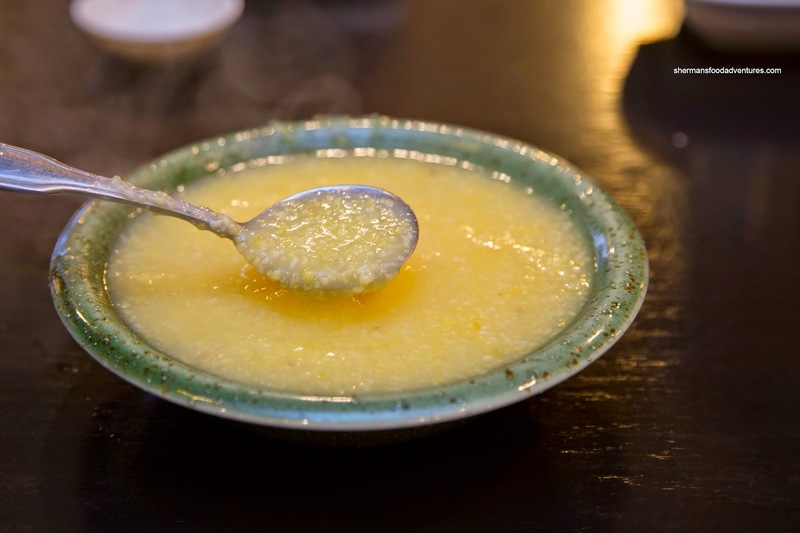 Millet Congee (xiao mi zhou), a staple of Northern Chinese breakfasts, should look rich and creamy (almost like risotto) but richly yellow. You're supposed to add sugar to it to enhance its otherwise "bland" taste. Some of the best millet congee I've had were in Taiwan, actually.